Are you watching the Oscars from your couch, surrounded by snacks and some wine, wishing you could transport to Los Angeles and walk the red carpet? It doesn't have to be that way. You could just drown in envy on Sunday night, watching Ryan Seacrest interview glamorously-dressed celeb after celeb and wonder, "When will my lucky day come?" Or you do what modern technology can let us to these days — pretend we're at the Academy Awards by living vicariously through social media. I mean, that's why Instagram, Twitter, and Facebook were invented, right? And believe me, these pics are so good it will really make you feel a part of the the awesomeness tonight. Besides, you shouldn't feel too bad. The Oscars are being held at the Dolby Theater in Hollywood, which is causing Los Angeles traffic to be so much worse than usual. Plus, it's raining in Los Angeles right now, which causes LA to freak out like the sky is falling. So, really, watching from your couch in pajamas isn't such a bad option — less pants, more snacks. And don't worry about scouring those hashtags for searching for pics, because I did that for you already. 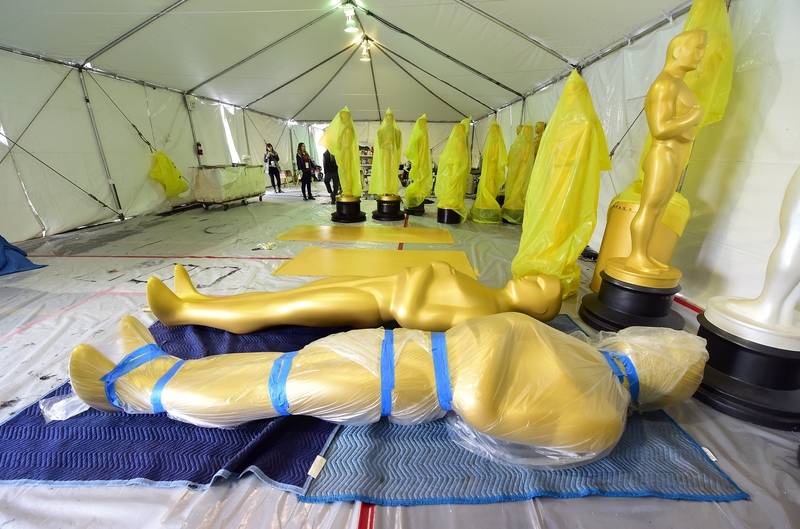 Here are some very cool behind-the-scenes photos from Oscar's red carpet to make you feel like you're there. To the final product on the red carpet. In the meantime, exec produces Neil Meron and Craig Zadan are behind the actual stage, getting things ready. Well, some of it was majestic, anyway.